After a very busy week that did not involve riding Rusty, I was going to say working with Rusty but technically we worked just didn’t ride, we got to go on a grand adventure today. 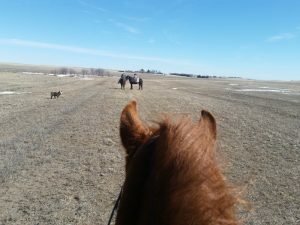 Tuesday he, and Coyote for company, rode along when we took the heifers for their Bangs vaccinations. Princess Onna got voted least likely to kill herself home alone and only two could fit in the trailer with the heifers. She was fine. I’m not sure that Coyote was much for moral support, his purpose in all this, he is a terrible hauler, but he was company at least. Rusty got his teeth looked at, he was having some trouble chewing on his fight side. He didn’t get any work done, she said there was so much growing going on she wasn’t going to touch his mouth until his grown up teeth were done coming in. He did get to work in the paring lot, along the highway, in fifty mile an hour wind. We got some Spanish walk and a bow before the vet looking out the window concernedly made me think that I ought to go get my children out of her office. She assured me they were fine but she was sure I wasn’t going to be able to get him loaded. He had reverted to the behavior he showed up here with. Again. It is kind of nice to have a reminder of how far he’s come, he crashes into everyone and drags you along at the end of the rope. I’m trying to get him out as much as I can, it would be nice if he could be his wonderful self all the time. That was a large part of the reason why we didn’t ride. The reason we did ride was twofold. Tanna was home for spring break! She wanted to know if she could come over. I begged her to. Paula was also on spring break and had time to ride without that nasty work stuff getting in the way. She invited us over to ride at the arena. I drug Tanna along too, and the kids, and all the horses. The dogs stayed home. Long story short, the kids did great. They both rode all around inside and out. Tanna did eventually get a horse to ride. I eventually got on Rusty. Paula eventually got her horses feet trimmed and her horse, unridden for months settled down and got on. The kids took off for parts unknown, hope they had fun. Then we decided to trail ride. Found the kids in the pickup, honking the horn. They were looking for snacks. They each got an apple. One got put back on Princess Onna, the other got to ride in front of Tanna and out we went. We knew our ride had to be short. 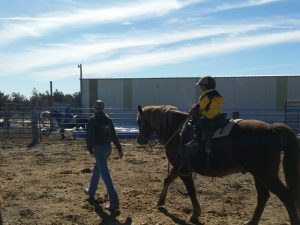 As soon as we all got settled and on horses we got a call that one of the cousins needed picked up at school unexpectedly. So we went around the hay field. Onna made it clear that she was not going to be ponied. 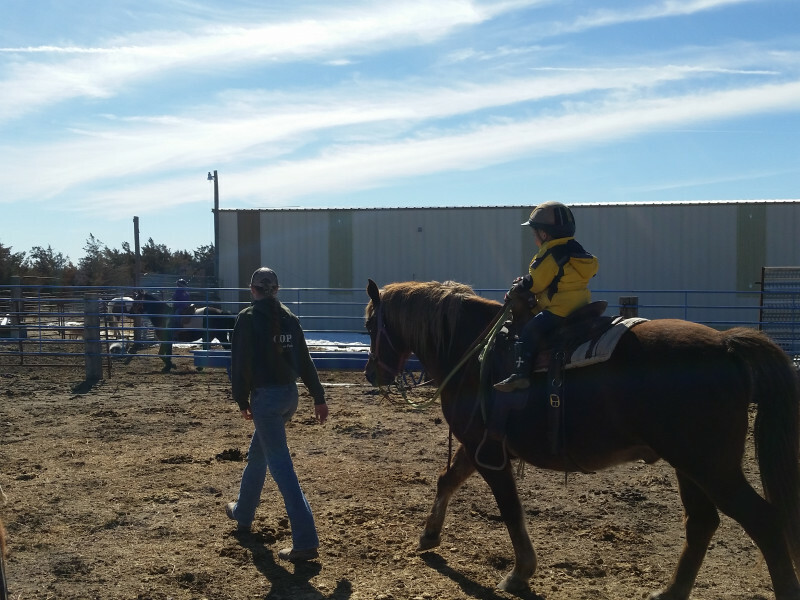 She is the greatest awesomest little mare, until you try to pony her. Then it is entirely possible to hate her. They got turned loose and did just fine, I don’t know why we ever doubt them. Rusty was a little antsy at first but settled down and did wonderfully. On the way out he set the pace at a walk even speedier than my other two speedsters. He didn’t spook. He didn’t buck. He was horrified by this new funny colored horse 😉 He kept looking, neck all arched, snorting and sniffing. The two dogs that were along decided they wanted to walk under Rusty. He wanted to stomp them. We survived though, dogs and all! Paula’s nice, older, broke mare was not alright. She had enjoyed her time off and was feeling her oats. They pranced and circled and at one point I realized that this was the horse she let me borrow last summer for the play day. I’m glad she hadn’t had so much time off then. We had lots of fun teasing Paula about just who was riding the crazy green colt. We had to rush back to make it to school in time but hopefully we can do it again. There are lots of good riding opportunities over there. We had time to ride more once we got home and Tanna and I rode out to look over the cows. They’re getting close to calving and I was curious just how close they were. We found two that looked quite near to the event and played on the hills in the pens. It was great fun. This evening one of our picks had her calf! Calving has begun. that is a fun story. i love the video. cant believe those kid scan ride like that, and on unicorn no less!